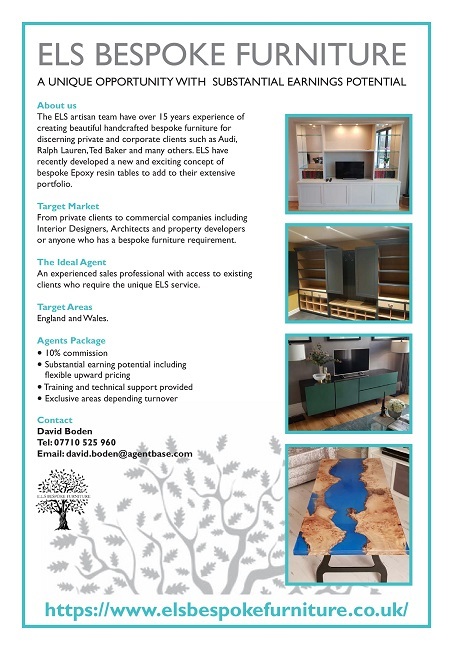 The ELS artisan team have over 15 years experience of creating beautiful handcrafted bespoke furniture for discerning private and corporate clients such as Audi, Ralph Lauren, Ted Baker and many others. ELS have recently developed a new and exciting concept of bespoke Epoxy resin tables to add to their extensive portfolio. From private clients to commercial companies including Interior Designers, Architects and property developers or anyone who has a bespoke furniture requirement. An experienced sales professional with access to existing clients who require the unique ELS service.